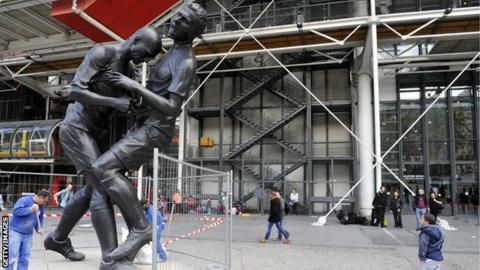 A five-metre high statue of Zinedine Zidane's famous headbutt on Marco Materazzi has been unveiled in Paris. France captain Zidane was sent off in the 2006 World Cup final, which his team went on to lose on penalties, for headbutting Italy defender Materazzi. The bronze statue, sculpted by Algerian artist Adel Abdesseme, is on display outside the Pompidou Centre in the French capital. Real Madrid and Juventus legend Zidane retired after the game in Berlin. Materazzi has admitted he provoked Zidane by making comments about the France midfielder's sister. Zidane is now working as a sporting director for former club Real Madrid.